I must admit that since Major Tom is minus any litter mates, I felt sorry for him all alone and so I have been cuddling him incessantly and even scooping him up from his basket next to my bed at night to let him sleep with me. A heating pad in the basket is an indispensible tool since single puppies don't have siblings to snuggle with. Some say that a single puppy will grow up to be much more independent and lack social skills, but who really knows? So he's in the "big boy bed" meaning I took the risers out of the whelping box and divided the box into a place to eat, a place to sleep and a place to poop. He is starting to get the hang of it. I leave the training pads up for a few days so that he can smell it but clean his bedding constantly so he can differentiate between the two spaces. He has little teeth now and is starting to eat puppy kibble softened with warm water. I decided to try a different food with this puppy and with the help of my friends at PetPeople, I decided on Fromm Puppy Gold. 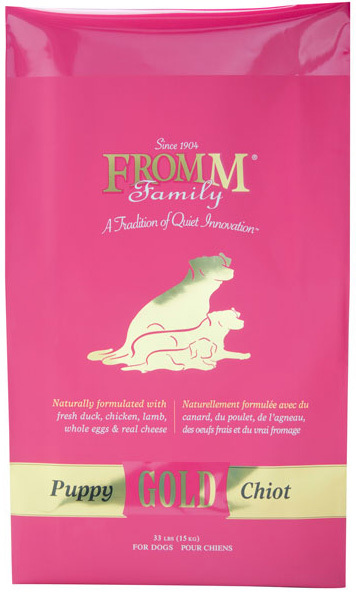 I like Fromm because they use 100% human food ingredients and the food is made in Wisconsin. Procter and Gamble (Iams) has had just one too many recent pet food recalls for me. Email me photos of your Bully in costume. Send me your Baby Bully pics. 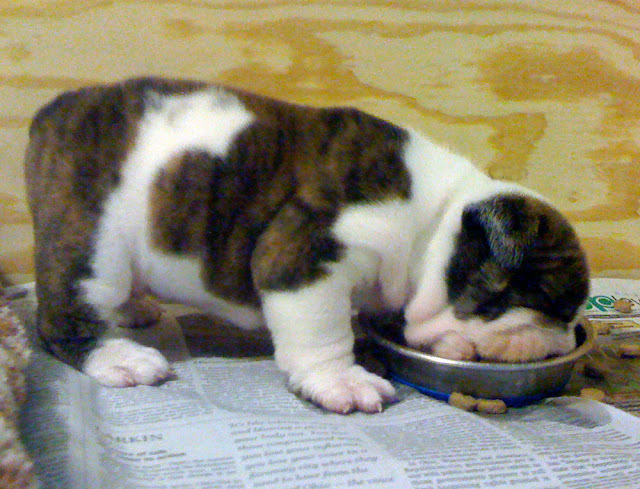 Honor your beloved English Bulldog that has passed away with a photo and story. 2011. Travel theme. Powered by Blogger.